eMedia CS card design software for Windows PC. eMedia CS card design software works on all modern versions of Microsoft Windows, in both 32 bit and 64 bit. Using a two tier application, DESIGN mode for template design, connection to databases and OPERATING mode for the printing of cards. Works with all plastic card printers. No USB Dongle required. License activation via internet. Licensed per PC. How to download & install eMedia-CS card design software. eMedia CS is compatible with ALL printer brands. 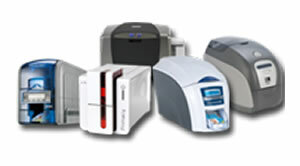 Evolis, Zebra, Fargo, Datacard, Magicard and others are supported. Multiple card templates, are possible with eMedia CS. Batch printing and Excel connection as standard. USB Signature Pad, works with eMedia CS. the Sig 100 and Sig 200 USB Signature pads capture signature electronically. If you have questions regarding card design or ID card printing call us to discuss. We can use remote desktop software to assist you. Click this link to go to the download page for eMedia-CS. 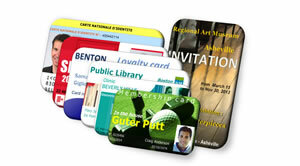 eMedia-CS allows you of designing and printing your plastic cards on any plastic card printer. If used with an Evolis Primacy printer, the software is a Standard Edition that allows connection to Excel datasheets. If used with any other printer, the software offers you the ability to work with the capabilities	of the Standard Edition for 30 days before needing a License Key.